Who invented the Frisbee? The name of the person credited with inventing the Frisbee is Walter Fredrick Morrison (1920 - 2010). Fred Morrison is not only famous as the American inventor of the Frisbee but also as a businessman and entrepreneur. When was the Frisbee invented? Fred Morrison invented the Frisbee in 1946, during the Cold War period of invention. The invention of the Frisbee originated in America and is a fun addition to the field of recreation and sport. The picture is of Fred Morrison promoting his Pluto Platters, the forerunner of the Frisbee. Definition of the Frisbee: The Frisbee is defined as a saucer-like flying, plastic disk roughly 20 to 25 centimetres (8 to 10 in) in diameter that is used for outdoor catching games between two or more players. Fact 1: Who invented the Frisbee? The Frisbee was invented by Fred Morrison in 1946 during the Cold War era of inventions. Fact 2: Who invented the Frisbee? Prior to the invention of the Frisbee in 1946, people used a ball to play recreational games. Fact 3: Who invented the Frisbee? The history of the Frisbee dates back to the 1870's, when an enterprising baker in Bridgeport, Connecticut began to sell homemade pies in re-useable tin pie plates. Fact 4: Who invented the Frisbee? The baker's name was William Russell Frisbie and this enterprising man came up with a novel idea for promoting his re-useable pie dishes. He put his company's name 'Frisbie' on the face of the tin plates as an usual, and unforgettable, marketing ploy. Fact 5: Who invented the Frisbee? William Russell Frisbie's pies, in their branded tin plates, were extremely popular and sold across the state of Connecticut. Kids began to use the tin plates as an alternative to throwing balls. As they tossed the dishes about they yelled "Frisbie" as a warning that the plate had been thrown, so no one would get hurt by the flying discs. Fact 7: Who invented the Frisbee? The Frisbie plated pies were sold to colleges and universities, including Yale, and college students, remembering the game played as kids, began to use the plates to play "Frisbie". The Inventor Fred Morrison picked up on the idea and a new 'toy' was born. Fact 8: Who invented the Frisbee? The inventor of the Frisbee, Fred Morrison, was born on January 16 1920 in Richfield, Utah, United States and died on February 9, 2010. Fact 9: Who invented the Frisbee? The early years of Fred Morrison were spent in Richfield, Utah, United States where he was raised by his family. Fred Morrison received a good education but did not undertake higher education at a University. Fact 10: Who invented the Frisbee? Following his education he eventually took up the profession of a building inspector. The idea for a new commercial version of a flying disc hit Fred in 1937 when, after eating a picnic lunch, began tossing a tin pie dish back and forth with his girlfriend Lu on a beach in Santa Monica. Fact 11: Who invented the Frisbee? People watching liked the idea of the game and offered 25 cents for the tin pie plate. As such dishes were sold for just 5 cents, it dawned on Fred Morrison that money could be made. Fact 12: Who invented the Frisbee? Fred Morrison married his girlfriend Lu and the couple began selling pie plate tins at local beaches. Fact 13: Who invented the Frisbee? WW2 (1939 - 1945) erupted and Fred Morrison became a pilot, and as he increased his knowledge of aerodynamics he realized that he could design a flying disc design that flew further, and more accurately, than pie tins. Fact 14: Who invented the Frisbee? He returned from the war and in 1946, financed by an Air Force friend Warren Franscioni, he designed the "Whirlo-Way" flying disc, with a fold-over lip for better aerodynamics, and started selling them at various fairs. Fact 15: Who invented the Frisbee? In 1947 interest in UFO's and flying saucers was stimulated in the United States by reports of a crashed "flying disc" at a ranch near Roswell, New Mexico. Fred Morrison changed the name of the "Whirlo-Way" flying disc to the "Flyin-Saucer". Fact 16: Who invented the Frisbee? In 1948, Fred Morrison and Warren Franscioni formed a company called Partners in Plastic, or Pipco, and in conjunction with the Southern California Plastic Company, and started manufacturing plastic "Flyin' Saucers". The two men staged flamboyant demonstrations to market the product. Fact 17: Who invented the Frisbee? Sales of the "Flyin' Saucers" dropped in the 1950's and Warren Franscioni re-joined the Air Force. Undaunted by the setback Fred Morrison went on to make his second flying disc in 1955 that, following a surge of interest in the planets and space travel, he called the "Pluto Platter". Fact 18: Who invented the Frisbee? 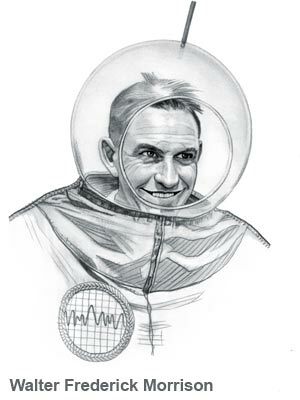 Fred Morrison used every trick in the marketing book to publicize the new "Pluto Platter" and dressed up in a futuristic space man suit to demonstrate trick shots, advertise and sell his product. Fact 19: Who invented the Frisbee? A demonstration of the "Pluto Platter" was seen by Rich Knerr and Spud Melin who had recently founded a toy company named Wham-O that sold just one product, a toy slingshot. They wanted to increase their range and in 1957 Fred Morrison sold the rights of the "Pluto Platter" to Wham-O and became an associate to work as a 'front man' for the company. Fact 20: Who invented the Frisbee? Wham-O took the old term "Frisbie" and because of trademark laws changed the name of the "Pluto Platter" to the "Frisbee". Fact 21: Who invented the Frisbee? The "Frisbee" became a huge success when the product was marketed not just as a toy and recreational activity but also as a brand new sport. Fact 22: Who invented the Frisbee? In the 1960's "Ultimate Frisbee", a strategic team sport based on a cross between football, soccer and basketball using flying discs instead of balls, began being played on college campuses. The game is now played in professional leagues In the US and Canada and in national teams. The World Flying Disc Federation (WFDF) was established in 2013 and disc related games are played in over 60 countries. Fact 23: Who invented the Frisbee? Fred Morrison died on February 9, 2010 but his name will be remembered as the inventor of the Frisbee. Who Invented the Frisbee - Fred Morrison - Inventor - Invention - Definition - Meaning - Famous - Important - Frisbee History - Frisbee Timeline - Innovation - Significant - Development - Sport - First - Frisbee Definition - Kids - Facts - Information - Info - Who invented the Frisbee - Dates - When - Why - Impact - Purpose - Use - New - Old - Amazing - Best - Definition - Meaning - Awesome - Cool - Cold War - American - History - Timeline - Who Invented the Frisbee?